Well well well welcome November! With its gun powder and plot! I love this time of year, to the non gardener, it seems the the start of the end of the gardening year, to the gardeners, they know it’s the start of next years display, with bulbs being planted, plants divided, seeds being sourced and sown and evergreens shaped. It’s these things that shaping my six on Saturdays for the next few weeks. 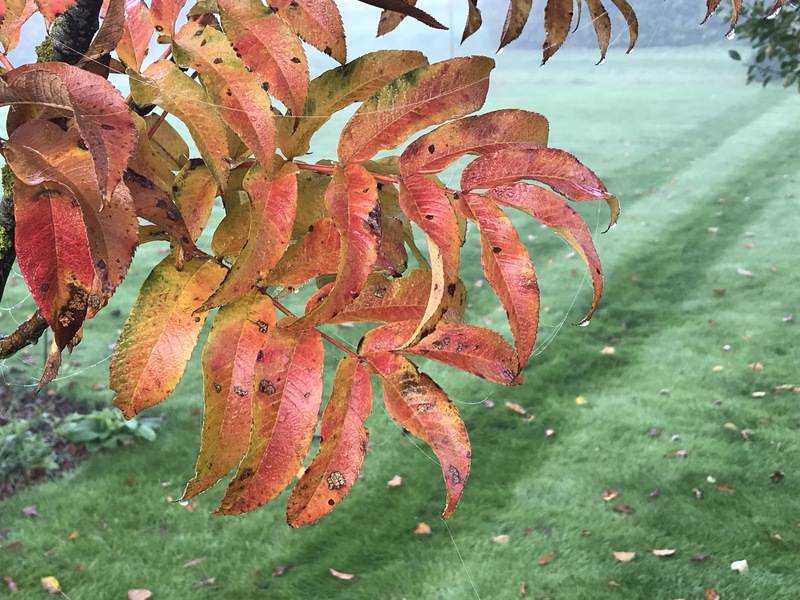 Not from my garden but I had to include it on this weeks 6, just so beautiful isn’t, it’s sorbus Sargentii in full autumn glory in a clients garden on Thursday. It’s faulty become one of my favourite Sorbus. Previous post: October, the neither month! Love your idea of putting fossils and Alpines together! And your Pyracantha is stunning. This makes a change. I’m usually envious of what’s in flower in others’ gardens as I look at my equivalents that went over ages ago. It’s a reversal this month as all my sedums are in full flower. And I’d forgotten that, last year, I dug out some of the pink ones (I had too many of those) and replaced them with some darker, brilliant reds. Which has been a nice surprise this year. Though I forgot to Chelsea chop so they’re all floppy. I’m trying to decide whether to get a gun and shoot all the b***dy blackbirds or dig out the Pyracantha. It’s just too much work for no berry display! Loving the idea of plant+fossil pots. Maybe in a few years I’ll have some Halloweeners’ skeletons. You’re in quite the murderous mood there John. Trick or treaters poisoned and buried in the borders, blackbirds shot. Terrifying stuff! Lol you are worrying me fella, semperivens growing out of a skull might be an interesting effect! Very jealous of the sedums mine finished weeks ago! Have to be honest if mine didn’t berry I would of dug it out by now, don’t really like them, positives though is it puts people off ringing the door bell! beautiful photos! This is my favorite time of year! Oh, look at all those pots, neatly planted up with bulbs. Very satisfying! My tiny sorbus were just planted last autumn. They did not do much this year, but Ihope they dispersed their roots well. I really do not know what to expect from it. I have never seen one before. I am not expecting much from them. I was told that some people keep them as big shrubbery, which would be fine with me. English hawthorn grows here, but is not happy about it. It can also be kept down, just because it is not too vigorous. That is actually an advantage for reaching the berries. Fossils and alpines look like a good combo.